Are you coming to Botswana? Are you looking for a way to spend a morning or afternoon in the Maun area? Sexaxa is about 20 minutes down the road from Maun and you can come there for a look into a different side of Botswana. Instead of just seeing elephants and rhinos, come learn about the rich culture that exists in this country! When you visit the Sexaxa Cultural Village, you are getting a glimpse into Bayei Culture both as it was in the past and as it is today. Your guide, Ednah Goitsemodimo, is a resident of Sexaxa who will entice you with history, answer your questions, and explain cultural customs of the Bayei people. You will get to meet Sisco, who will play the tswarawara and the setinkane for you, instruments you may never have seen before. You can discuss marriage customs with some local women like Keitireiste, who has been making baskets since her mother taught her as a girl. Try your hand at pounding grain, see traditional dancing and traditional homes, test some dried food, and more. After you are done learning and sharing a little bit of your own culture, you can check out the baskets and other crafts that are made in the village. Do all of this in good conscience-- the money earned through cultural tours goes into the Sexaxa Development Trust which was set up to benefit the community. The people who work at the cultural village are volunteers. 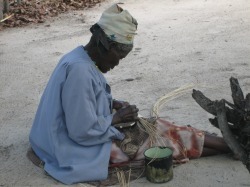 The money from basket/craft sales goes directly to the makers, right there in Sexaxa. Be a part of a cultural exchange that is mutually beneficial.